"During of night while I was away on a ministry trip, I had a most unusual dream. In this dream I was taken to this place where it seemed to me that demonic hordes were being held in three different compartments that contained three different types of demonic beasts ordained to be released at a specific time and season. As I kept watching, I saw as each one of these compartments was opened one by one and the beasts were released. The ones in the first holding cell were fierce looking, but the beasts in the second and third cells looked even more horrible and intimidating than the previous ones. I sensed in my spirit how these terrible looking beasts were desperate to get out and begin to kill and destroy everyone that stood in its way. As the cells were opened and the demonic hordes released, I could sense that the time had come for this to take place. Then I was awakened and I wondered about it"
Based on what I saw, I believe that the time is at hand when these demonic hordes from hell are about to be released. I don't know if this has anything to do with CERN trying to open the bottomless pit; but it sure looks like it is getting ready to happen somehow. Once again, as we have said many times, now is the time to get right with Jesus Christ and make your calling and election sure. Time is running out and the sand is almost gone out of the hourglass. Shalom. Revelation 9:13-21 "And the sixth angel sounded, and I heard a voice from the four horns of the golden altar which is before God, Saying to the sixth angel who had the trumpet, Loose the four angels who are bound in the great river Euphrates. And the four angels were loosed, who were prepared for an hour, and a day, and a month, and a year, to slay the third part of men. And the number of the army of the horsemen were two hundred thousand thousand: and I heard the number of them. And thus I saw the horses in the vision, and them that sat on them, having breastplates of fire, and of jacinth, and brimstone: and the heads of the horses were as the heads of lions; and out of their mouths issued fire and smoke and brimstone. By these three was the third part of men killed, by the fire, and by the smoke, and by the brimstone, which issued out of their mouths. For their power is in their mouth, and in their tails: for their tails were like unto serpents, with heads, and with them they do hurt. And the rest of the men who were not killed by these plagues yet repented not of the works of their hands, that they should not worship demons, and idols of gold, and silver, and bronze, and stone, and of wood: which neither can see, nor hear, nor walk: Neither repented they of their murders, nor of their sorceries, nor of their fornication, nor of their thefts." "I was in this place I have never seen before. I saw thousands of lions and horrible lookings beasts surrounding us (Christian believers)everywhere. They were attacking, killing and devouring all of the Christians present. These monsters seemed to come from under us, while the lions were on the surface. I was astonished and frightened at what was taking place when I suddenly woke up." Sometime in the future, the pit of the abyss is going to be opened and there will begin to come forth upon the earth the most ungodly, evil demonic monsters we have ever seen. These entities will possess those who are not full of the Spirit of God and cause them to do the most evil inhuman acts of brutality and barbarism. 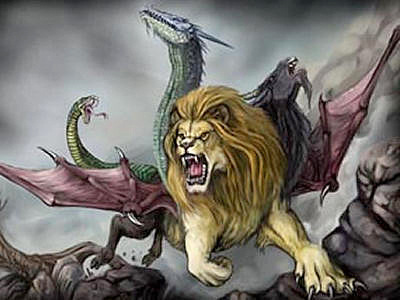 Also, the lions upon the earth symbolize Christian persecution coming upon all the earth by demonized, Christ hating men that will seek to kill and destroy the remnant seed of the LORD. However, the LORD will intervene in the end and bring an end to this horrific holocaust. Get close to the LORD while there is yet time. Revelation 9:1-11 "The fifth angel sounded, and I saw a star from the sky which had fallen to the earth. The key to the pit of the abyss was given to him. He opened the pit of the abyss, and smoke went up out of the pit, like the smoke from a burning furnace. The sun and the air were darkened because of the smoke from the pit. Then out of the smoke came forth locusts on the earth, and power was given to them, as the scorpions of the earth have power. They were told that they should not hurt the grass of the earth, neither any green thing, neither any tree, but only those people who don't have God's seal on their foreheads. They were given power not to kill them, but to torment them for five months. Their torment was like the torment of a scorpion, when it strikes a person. In those days people will seek death, and will in no way find it. They will desire to die, and death will flee from them. The shapes of the locusts were like horses prepared for war. On their heads were something like golden crowns, and their faces were like people's faces. They had hair like women's hair, and their teeth were like those of lions. They had breastplates, like breastplates of iron. The sound of their wings was like the sound of chariots, or of many horses rushing to war. They have tails like those of scorpions, and stings. In their tails they have power to harm men for five months. They have over them as king the angel of the abyss. His name in Hebrew is "Abaddon," but in Greek, he has the name Apollyon." Revelation 12:11 "And they overcame him by the blood of the Lamb, and by the word of their testimony; and they loved not their lives unto death."